What about nights, weekends, holidays and emergencies? What areas/locations do you service? Do you service areas outside of Virginia? Do you provide general veterinary care? Phones are monitored Tuesdays-Fridays from 10am-6pm. If you reach the voicemail during this time, it is likely because we are at an appointment. Please leave a detailed message and we will call back as soon as we can. All messages will be returned within 24 hours at the latest. Appointment hours are based upon your needs and are not necessarily restricted to the phone hour times. We do try to work with your schedule and accommodate your needs as best we can. However, we are not always available on an emergency basis. If you feel you may need our services in the future, we encourage you to reach out to us sooner than later. This will enable us to answer any questions you may have and also allows us to "keep you on our radar" so we can better serve you. We know sometimes the phone call is hard to make. E-mail is a fine way to open the conversation, too, if it is easier!! We are not licensed to practice in West Virginia, Maryland, or DC. Please consult with Friendship Animal Hospital http://www.friendshiphospital.com or consult the In Home Pet Euthanasia Directory http://www.inhomepeteuthanasia.com/ for service providers in your area. We are not equipped to provide general veterinary care (i.e. 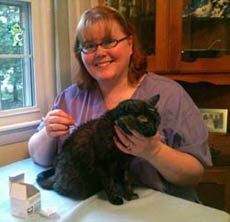 vaccines, general wellness visits, sick visits for otherwise healthy pets, etc.). However, we will be happy to assist you with your pet's acupuncture, pet rehabilitation, or pain management needs. When the time comes, it will be an honor to also assist with hospice care or home euthanasia and to help you through this difficult time.